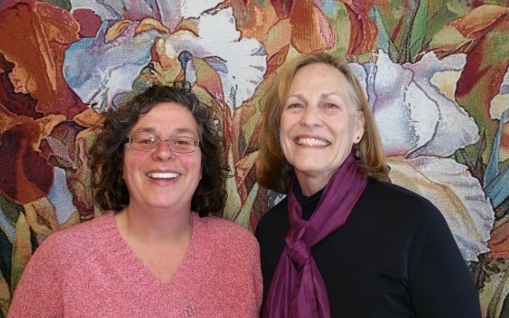 In any given week, Sharon Weeks and Annina van Voorene may find themselves delivering birthday flowers, arranging for a repair to a home wheelchair ramp, making travel arrangements, counseling a family whose loved one is dying, filling out forms, or researching dog-friendly cruises. Weeks and van Voorene are social workers. They are committed to bringing positive change to people’s daily lives. Social work is a unique calling that stretches beyond hours of the day and days of the week and a list of job duties. Social work is a commitment to caring. It is great work for a higher purpose. Weeks and van Voorene work for Hospice Services of Lake County. They are part of the team of professionals that surround hospice patients and their loved ones. Within 48 hours of a patient’s admission to hospice, the patient and family receive a visit from one of the social workers. The social worker talks with the family to learn what assistance might make a difficult situation better. Does the family need a resource for legal counsel or financial advice? Would they benefit from available community resources? Would counseling help the family members cope with anticipatory grief? Do they need help resolving problems with their insurance? Each family is different and has its own unique situation. The job of the social worker is to identify the needs, make connections to the appropriate resources and take action to get those services in place. They are tenacious and persistent in their drive to help solve problems when many others can’t. Weeks has worked for Hospice for over 25 years. She says the greatest skill a social worker can have is to be a good listener and be fully present while listening. Social workers are also counselors. She and van Voorene take time to listen to the fears and anxieties of the caregivers and the family members. “We offer suggestions, respect their wishes, and help them find balance,” Weeks stated. She is quick to praise the caregivers, reminding them that the act of caregiving is a precious gift that they give to their loved one. March is National Social Work month. Hospice Services of Lake County honors Weeks and van Voorene for their compassion and commitment to helping hospice patients and families get through difficult times. For more information about hospice services, which is fully funded by Medicare, or to request a confidential consultation, call 707-263-6222.